“This is the same ‘veteran’ who conspired with a sitting Democrat (sic) County Commissioner to take three Republican Commissioners (two veterans) to court,” Smith wrote Friday, putting quotation marks around the word “veteran,” in a post on the North Carolina Truth Seekers Facebook page, which has 5,000-plus members and features political discussions, usually in meme format, from a handful of mostly conservative local activists. Calendine was awarded the Purple Heart after being injured in Iraq by a roadside bomb in 2009 and later medically retired from the U.S. Army. He is also a recipient of the Army’s Combat Action Badge. Roberts, himself apparently an Army veteran as well, also refers to Calendine as a “poge,” which appears to be derogatory military slang for a veteran who didn’t engage in combat, while another commenter advises folks to look up the British slang term “walt,” which apparently refers to people who misrepresent their military service. One of the Facebook group’s moderators, former state representative and friend of the Rant Mike Stone, who is not a military veteran, commented on the post that the group operates on First Amendment principles and that he never deletes comments even though “no one has been bashed more on this page than myself.” LOL. In any case, it goes without saying that on a Facebook site that consistently displays some of Lee County’s more disgusting behavior, today’s outright attacks on the military service of someone who happens to disagree with conservative politics represent a new low. That they’re generated by current and former elected officials is all the more disappointing. Expect more of the same from Smith when he’s (likely, he does face a Monday recount after winning election by just 55 votes) seated on the Board of Commissioners next month. Buckle up. For a long time, local Republicans respected the military service of Democrats, even if they disagreed with them or failed to endorse them on a sample ballot. I wonder if this is the beginning of a new trend; if you’re a veteran and a Democrat, then your military service is dishonorable and your service medals are meaningless, because we say so. Your Service is not dishonorable nor is your service medals meaningless. However they do not give you the ability to hide behind them either. For you to throw out your veteran status as a means to silence those that disagree with you is the problem. you can play victim all you want. A true warrior is never a victim, The reality is we were in a heated debate and you didn’t think I was a veteran and felt the need to flex your veteran status to which I was not impressed and pushed back. The truth is your sacrifice to our country is no greater or less than many others. 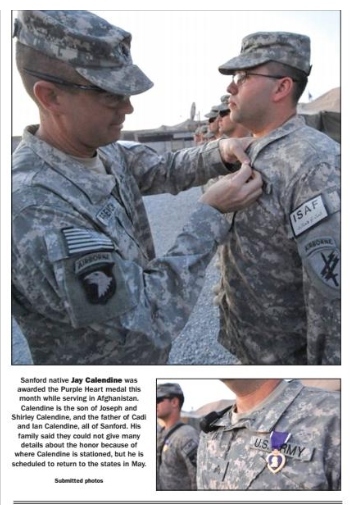 Non-Veterans put a lot of weight behind the Purple Heart. you and I both know that the Purple Heart is not necessarily a symbol of valor. You can get one for a bloody lip in a combat zone or for getting shot while running on to a machine gun bunker. one is an act of valor the other is happenstance. Only you and those that were with you that day know if yours is valorous or you just hurt because you were in the wrong place at the wrong time. The point is, your medals and awards are not meant to silence those that disagree with you. To me and many other Retired Combat Veterans you look like your are trying to get excessive sympathy. IMHO you should wield your Veteran status with humility and understand it was a privilege to serve and nobody owes you anything more than you were promised. Nobody owes us respect or should pay homage to any of us. We Served our Country and the privilege to serve is is on us to give thanks to those that entrusted us with their safety not the other way around… That is Just my humble opinion. take it for what it is worth. you can either walk around thinking people owe you for your service or you can thank them for letting your serve… your Choice. You’ve made this specious claim over and over, that I brought up my military service to silence others. Dale, you googled me, found my claim to be a retired veteran, and used your speculation about my service, retirement, and Purple Heart to attack me. I don’t know if Jay accepts your backhanded apology when you say that his service, in fact, wasn’t dishonorable (your original insult was that while in the service he was a “low-level nothing”). I also don’t know if Tammy DiGregorio- the woman you referred to as “dumb Navy veteran” in a (recently deleted) comment – would either, but I am confident that neither of them need any validation from you when it comes to the nature of their service. You’ve continued ad nauseum that Jay brought up and was trying to “flex” his veteran status, when in fact the only one trying to “flex” was you. In no particular order from your own (recently deleted) comments – “Retired Veteran… 25 years in the service… Fought in 2 wars as a Ranger Qualified Airborne Infantry Soldier… 100% disabled.” And the real kicker was when you told a fellow veteran “you must be a real piece of unAmerican (sic) crap for challenging me” (also recently deleted). The only one bragging about his military service in an effort to shut someone up was you. And, you were also the only one insulting the military service of others. 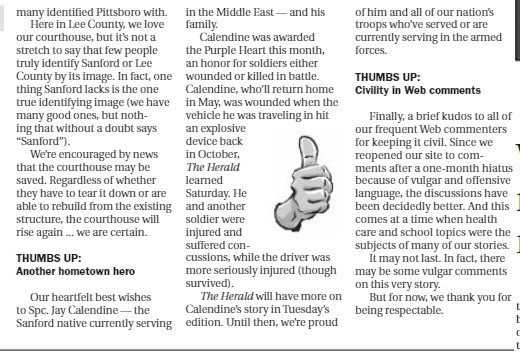 In my letter to the editor I said you represented the worst of our society and community. But, you also represent the worst of our military. 1. Democrat posts something Dale doesn’t like. 2. Dale finds out that the above Democrat is a veteran. 3. Dale insults that veteran by trashing their service, branch of service, retirement status, or awards. 4. Dale touts his own military record, as if he believes that he’s better than the above Democrat. 5. Dale deletes most of his comments. 6. Dale lies about the entire discussion, framing himself as the victim of a veteran who somehow challenged his military service. “Veteran.” I’ve never called you a “First Sergeant,” or a “Commissioner,” even. And, maybe you should look up the word “attack” in the dictionary. As a combat veteran, I know well the meaning to which you refer, but there are more general definitions, as well. It is interesting that the writers of the article strategically left out any comments from the Protected Joseph Calendine. They have no problem showing only snipets of conversations while leaving out what was said before or after, only the parts that support their position to try and paint the picture of Calendine as a poor innocent victim getting picked on by other Veterans. If you are going to be a “News” or Impartial information blog or page, then you owe the readers the whole story and all that was said, then they can make up their own minds. To only show edited screenshots and give a very biased twist to the entire discussion is deceptive and discredits the legitimacy of any information source being read by anyone that is intellectually honest and a critical thinker, which I suspect your blog probably doesn’t hold up under scrutiny very often. Now I know why you’ve deleted so many of your comments on Facebook; you want to lie about how all this started, to make you look better. I never raised my military service; you looked it up and trashed me for it. We weren’t in a “heated debate.” I never doubted your veteran status. You know what is dishonorable? Lies. You, I, and the many of us who screen captured that thread on the SH FB page know precisely what happened. My conclusion- Facebook is evil. Avoid it at all costs. I have reached out to Jay Calendine. Since we fought publicly, I will apologize publicly.